Sandpiper Guest Cottages are in Boggomsbaai, a peaceful, safe and secure coastal village just 20 minutes from Mossel Bay on the Garden Route. Rustic Cape cottages. Candlelit evenings and a cosy fireplace. Peace, safety and tranquillity. A golden unspoilt beach where dolphins dive, seagulls swoop and black oystercatchers dart along the shores edge. Sandpiper Cottages have the character and atmosphere of time gone by. Attractively furnished two and three bedroomed cottages offer self-catering or bed and breakfast options. Romantic honeymoon cottage. The private sport and wellness centre offers squash, tennis, a gym and massages by appointment. Nearby activities include game farms, boat trips, golfing, hiking, bird and whale watching. Breakfast and dinner available by arrangement. Cottage with 4 bedrooms en suite 2 bedrooms and 2 bathrooms downstairs, 3rd loft bedroom and shower upstairs, large 4th bedroom with 4 single beds (en suite) annex DSTV, Large indoor fireplace, pizza oven on patio, double garage. Cottage with 4 bedrooms, 3 bathrooms. 3 bedrooms, 2 bathrooms downstairs and a loft bedroom en suite. Cozy Log Cabin with amazing ocean views. Covered Outside braai. Ideal for families or very close friends. 2 Double beds 1 Twin room Main Bedroom ensuite and one full bathroom Open plan lounge and kitchen. "Beautiful cottage, very well appointed with good attention to detail. Fred welcomed us personally and was very helpful. 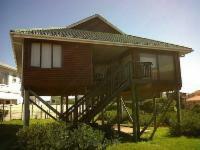 Would recommend Sandpiper cottages to anyone looking for accommodation in Boggamsbaai." Exit N2 at Boggomsbaai sign 15 km west of Mossel Bay and 34 km east of Albertinia. After 11 km turn left at small Boggomsbaai sign. Sandpiper Guest Cottages are on the next corner.